As well as cycling, I'm also a big fan of food. The two kind of go together - I exercise so I can eat more, and I eat more so I can exercise. Symbiosis. Now there's a word. For my birthday I was bought an evening of butchery - not the stab-your-victim-in-a-darkened-alley type, but the cut-up-dead-animals-with-a-very-sharp-knife type. It was fascinating. Held at The Ginger Pig, the evening started with a talk from Borat - Slovakian I think, rather than Kazak. Our course was on beef, so we learnt about different cuts, where they come from, how to cook them and aging (the good dry-aging and the bad wet-aging). We then moved onto the meat, where another butcher (I forget his name, it wasn't as memorable as Borat) showed us how to cut up almost half a cow into the major sections and explained how different cuts, on and off the bone, are known by different names. Did you know that the main chunk of meat in a fore-rib join is rib-eye steak? And that a sirloin steak with the bone left on is a porterhouse? You did? Really? Oh. You probably eat more beef than I do. We then all had a go at cutting a chunk off the big side of cow - using saws, super-sharp knives and a little stabbing knife. That was the technical term for it. With the right tools and instruction it was reasonably simple, but I imagine we'd have made a whole lot of mince without either. Oh, there was a lot of slapping of the meat too. The butcher claimed it was a butchery tradition, but I have my doubts. 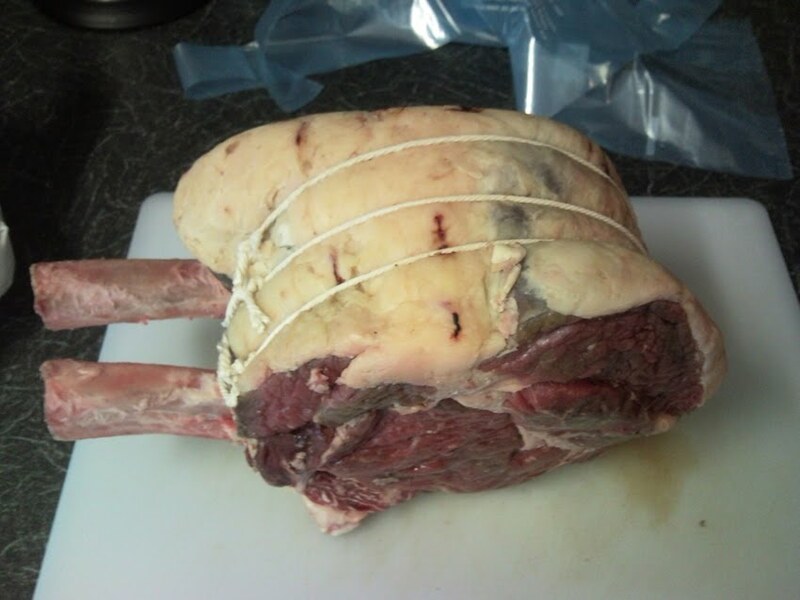 After the chunking we all got a section of fore-rib, which we turned into "Cote de Boeuf", by removing the cap, deboning one side, unrolling it, cutting out the paddywhack, putting the cap back, French trimming the ribs and finally tying it up with string. Impressive huh? That's about £45 of meat there (included in the price of the course), sitting in my kitchen. We then ate chunks of a bigger version of above - with five ribs - served rare with dauphinoise potatoes and a cheeky red. Yummy, and very filling. We joked how glad we were that there wasn't a pudding... and then a brioche bread and buter pudding turned up. I did my best. More chat, including some bloke quizing the butchers on their income (must be a London thing), then a dash for the train. I'd really recommend it - it's not often I get to saw through bones without the victims owners screaming.